Cheryl Rush Cowperthwait's debut novel, The Legend of the Dragon Child, sets this series in motion. Book Two of the series, The Legend: Revealed continues the story with many of the same characters while introducing new worlds and characters to bring you on an exciting adventure. For those television fans who have fallen in love with Daenerys Stormborn, the mother of dragons in HBO’s Game of Thrones, here is a fantasy series and a heroine you will love just as much, if not more. Daenerys is the mother of dragons. She was given three dragon eggs and she caused them to hatch into live dragons. Kaida, the Dragon Child of The Legend: Revealed by Cheryl Rush Cowperthwait, is in many ways the opposite of her Game of Thrones counterpart. She is a human child whose birth is aided by dragons when her mother dies in childbirth. In many ways that is where the similarities between the television show and the book by Cheryl Rush Cowperthwait end. Game of Thrones is very much a story of humans, while The Legend: Revealed is the story of dragons. I like this story of dragons more. It is full of magic, dragons, catastrophic events, and love. Kaida is raised by dragons so her personality is a bit peculiar by human standards. She has some special abilities like magic and the ability to communicate with animals. So along with dragon friends and family, she is also protected and loved by Sigrunn and Tyrianua, a couple of white wolves that have been with her since they were pups. These non-human characters are one of the best aspects of the story in my opinion. Kaida is a child of prophecy and has a big role to play in the time of great change that has already started. This prophecy is what propels the plot forward and the writing of Cheryl Rush Cowperthwait keeps the suspense and drama going. A great book for young readers, especially young girls. The Legend: Revealed by Cheryl Rush Cowperthwait is a high fantasy novel. This is the second book in Cowperthwait's The Legend of the Dragon Child series. The story revolves around the Dragon Child, Kaida, and among many others, Zlemtec, Kaida's dragon friend. At the beginning of The Legend: Revealed, Kaida is cut off from her friends and allies, and she is made to live and survive mostly on her own until she can reunite with them. 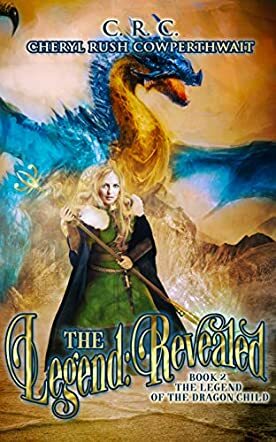 To begin with, because The Legend: Revealed is the second novel in a high fantasy series, it is more than likely new readers will get a bit lost, and may be a little intimidated by the overload of information and the richness of Cowperthwait's story. I suggest reading the first book before jumping into The Legend: Revealed. Regardless, I am used to high fantasy novels and fantasy in general so I was able to grasp most things, especially because of the prologue. Without giving any spoilers away, I will say that I enjoyed reading through The Legend: Revealed, mainly due to Cowperthwait's very polished writing. I was able to envision Kaida's story and, as I read on, I felt transported with every word that seamlessly flowed. "The ground they walked upon was thick blue-green moss, which cushioned each step and sprung back as their foot moved to another spot." I highly recommend fans of fantasy to give Cowperthwait's series a try. Emotions will be rattled, but the promise of action, suspense, and adventure await. This author has proven she is a major story teller and weaver of magic. These dragons and their wonderful child, Kaida, take us on more adventures filled with excitement. I would suggest reading the first book first and then enjoy this one and get ready for the next book in this wonderful series.